Seventy-five (75) percent of people with dementia and 64 percent of caregivers believe there are negative associations for those diagnosed with dementia in their countries, according to survey fielded by Alzheimer’s Disease International and published today in the World Alzheimer Report 2012: Overcoming the Stigma of Dementia. The report was released on Alzheimer’s Action Day as part of World Alzheimer’s Month activities engaging people in the cause and raising awareness about the disease. In response, Alzheimer’s Association® Early-Stage Advisors, men and women from across the U.S. living with the disease, and their caregivers developed tips on how to cope with the stigma surrounding Alzheimer’s based on their personal experiences. In the current Report, nearly one in four people with dementia (24 percent) who responded to the survey said they hid or concealed their diagnosis, citing stigma as the main reason. They expressed concerns that their thoughts and opinions would be “discounted and dismissed,” and that they would be “treated more positively” if they did not reveal their diagnosis. The report found that when people with dementia are able to make new connections, it is often with people in similar circumstances. Sixty-six (66) percent of survey respondents who have dementia said that they have made friends who are connected to dementia, often finding each other through community-based support groups, online chat or bulletin boards, or through Alzheimer associations. “People with dementia, especially in the early and middle stages, can take part in many everyday activities. They have the same needs as everyone else for social interaction and engagement in meaningful activities, even in the later stages of the disease. We encourage people living with Alzheimer’s or another dementia to be involved in making decisions that affect them for as long as they can, to help maintain their autonomy, dignity and self-esteem,” Kallmyer said. Don’t be discouraged. Denial of the disease by others is not reflection of you. If people think that Alzheimer’s disease is normal aging, see it as an education opportunity. The Alzheimer’s Association also recently launched ALZConnected, a social networking community designed specifically for people with Alzheimer’s disease and caregivers. After becoming a member (at no cost), ALZConnected users can connect and communicate with people who understand their challenges, pose questions and offer solutions to dementia-related issues and create public and private groups organized around a dedicated topic. The Report released today includes 10 recommendations to enable governments and societies to tackle stigma, including encouraging greater public education. Nearly half of the survey respondents pointed to increasing education and raising awareness about Alzheimer’s and dementia as a much-needed, high priority action. Other recommendations are to provide more opportunities for people with dementia to share their experiences and ensure that they are included in everyday activities. ADI states, “the World Alzheimer Report 2012: Overcoming the Stigma of Dementia shares results from a worldwide survey conducted with people with dementia and [caregivers] on their personal experiences of stigma.” The anonymous online survey was conducted in June 2012 and completed by more than 2,500 people with dementia and caregivers from 78 countries. 2,068 responded in English; 519 responded to versions of the survey in Spanish (282), Greek (94) and Chinese (143). According to ADI, of the 127 (6%) of respondents with dementia in the English language survey, most reported that diagnosis (or discovery of dementia) had occurred within the last five years (51%). Sixty-one percent (71) of respondents indicated they were female and 39% (46) male. Diagnoses included Alzheimer’s disease (55%), vascular dementia (12%), mild cognitive impairment (10%), and fronto-temporal dementia (7%). The largest group of respondents with dementia indicated they were between 63 and 72 years of age, with a little over half of the participants (56%) being at or over age 65. Individuals with dementia responded from 13 countries including Australia, Canada, Finland, United Kingdom and the United States, with the U.S. having the most at 55%. 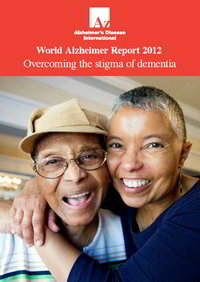 ADI, an international federation of 78 Alzheimer associations around the world, including the Alzheimer’s Association (U.S.), has produced an annual World Alzheimer Report since 2009, previously covering topics including global dementia prevalence and global cost of dementia care. The Alzheimer’s Association is the world’s leading voluntary health organization in Alzheimer care, support and research. Our mission is to eliminate Alzheimer’s disease through the advancement of research, to provide and enhance care and support for all affected, and to reduce the risk of dementia through the promotion of brain health. Our vision is a world without Alzheimer’s. Visit alz.org.